Help us during your shop! 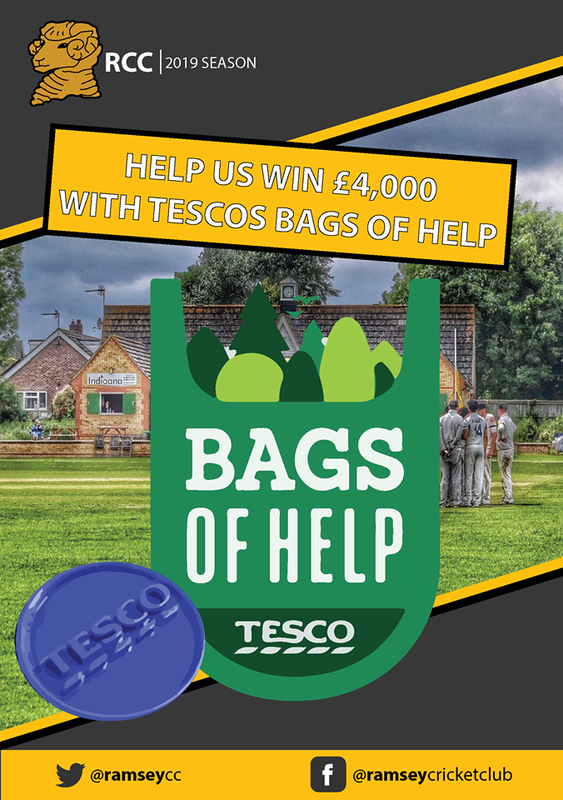 ​We have been chosen to be one of 3 local causes to participate in Tescos Bags of Help scheme in order for us to win up to £4,000! We plan on using this to develop our junior section and renew large amounts of equipment that will DIRECTLY impact the local community in RAMSEY. Please place your blue tokens in our box! Share with your friends, family and work colleagues and let's smash this! ​I am writing to inform you that pre-season nets have now been booked and I would therefore like to invite you to book a place. Dates and costs are listed below. We can accept up to 25 children for each session, so please book on to avoid disappointment. Lastly just like to wish you all a Merry Christmas from the Ramsey Junior Section and a Happy New Year. ﻿Ramsey embarked on a new venture as they played their first ever match in the Fenland trophy vs March Cricket club. Ramsey won the toss and decided to bowl giving new signing Tom Thackray a chance to open the bowling with one of last years under 15's PJ Malem. Both bowled very well and won the battle against some early big hitting from the hosts. PJ Malem took the first wicket caught by Matthew Slack at cover. Tim Willis and Jace Anderson came on first change and both left armers bowled well in partnership , Jace Anderson bowling 6 overs for 12 runs. Tom Thackray came back for his 2nd spell and took 2 wickets in 2 overs to give him his first Ramsey wickets. TJ Harding also bowled well taking 1-16 off 4 overs. Ed Machett and TJ Harding took the crease knowing just over 4 an over would give the team their first win. A good start by both saw the Rams make a steady start with both openers making 12 and 14. Ollie Stevens came to the crease as number 3 and showed some powerful hitting before being caught in the deep on 30. Mark Saunders the youngest player on show batted steadily rotating the strike before being bowled by a very good yorker from the March bowler. James Woodward back playing for the Rams this year helped the youngsters at the crease and made a swift 32 before being given LBW. Ramsey lost a quick 3 wickets loosing Anderson, Thackray and Charlie Saunders. Ramsey needing 60 off the last 12 overs saw Matthew Slack and Tim Willis left at the crease to win the match , the Rams passed their target with 4 overs to go and a win in their first ever Fenland Trophy match. An excellent win by the team and all wickets were taken by the juniors on show plus some confident batting by Ollie Stevens made the result even more pleasing. Junior training starts this week on Friday at Ramsey Cricket Club. Examples of the seasons shirts, tracksuits, training gear etc will be available for order. Get your orders in on time for the season launch! There may also be some discounts available on the evening! !